Colorado Golf Club just announced three, award-winning builders—Ascent Builders, Sienna Custom Homes, and Galiant Homes—offering a number of finely crafted custom homes that will completely change the way buyers are able to build within the highly acclaimed golf club community. Homesites range in size from one-to-five-acres, and are competitively priced from $2.45 million to $3.5 million. Katie Williams and Mimi Sturtevant of LIV Sotheby’s International Realty (LIV SIR) are named exclusive colisting brokers for the project. “The best kept secret in town is out!” says LIV SIR co-listing broker Mimi Sturtevant. “Colorado Golf Club is enjoying unprecedented building growth and welcoming new residents to the community monthly. Located in Parker and nestled in 1,700 acres of rolling hillsides, perched to enjoy sweeping Rocky Mountains views, yet 10 minutes from big city amenities. It’s inspired living for those who seek an unsurpassed Golf Club experience, a secluded location, and a comfortable lifestyle. Golfweek Magazine ranks Colorado Golf Club number 33 on its list of Top 100 Modern Courses, and was recently awarded the 2019 Men’s Mid-Amateur by the US Golf Association. Each custom crafted home will offer thoughtfully designed floor plans and luxurious finishes, accommodating fiveto- six-bedrooms, six-to-eight bathrooms, and generous indoor outdoor areas built to entertain. Multiple decks and terraces are incorporated into each home to showcase the area’s majestic Front Range views. Ascent Builders Lot 133 located at 7329 Eagle Moon Court is currently listed for $2.45 million with estimated completion by winter of 2018. Situated on a 2.46-acre cul-de-sac lot, it fronts and backs to open space with close proximity to walking trails and Betts Lake. The contemporary farmhouse architecture is vintage inspired, featuring a cool-toned color palette, lower level walkout, and four-car-garage. Highlights include a main floor master suite, spacious recreation room, four fireplaces, billiards area with wet bar, plus optional wine room. Founded by two corporate executives, Ascent Builders set out to fill in the gaps they felt was missing in the Colorado construction industry—a company dedicated to delivering highquality customer service with high-quality craftsmanship. Ascent Builders president, Jason Brown, and his team have done just that, offering a collective 50 years of experience to address this significant need while catering to a discerning clientele. Sienna Custom Homes Lot 14 at 7832 Forest Keep Circle is listed for $2.5 million with estimated completion by fall of 2018. This 1.55-acre corner home site backs to the Short Course and is within walking distance to the Club, pool, and driving range. Featuring mountain Montana architecture, it offers a warm transitional interior and four-plus-car-garage. A sizable main floor master suite, plus lower level recreation room with wet bar and billiards area, and upper level guest suite with kitchenette and deck are among its unique features. President John Rottschafer of Sienna Custom Homes has spent over two decades in custom home building, combining proven expertise with a strong devotion to quality and customer satisfaction. They are best known as the winner of the 2016 MAME Award for Best Custom Home 5,000-square-feet and over. The company was founded on two core beliefs—engaging clients in a detailed consultative process, and examining every aspect of the building site to maximize its potential. With this knowledge, they are able to design and build custom homes that capture the best attributes of the site, while fulfilling all of your needs. And, coming soon is Galiant Homes Lot 22 at 8250 Whisperwood Court with estimated completion by winter of 2019. 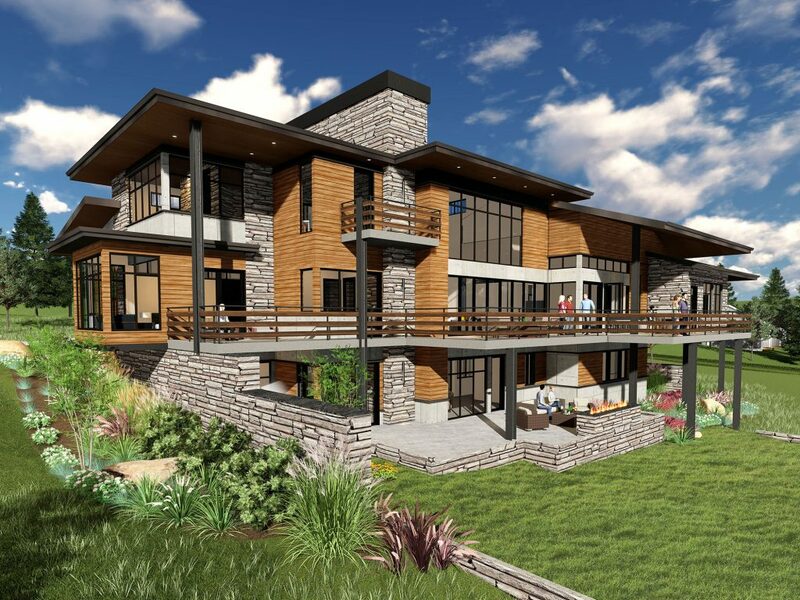 The urban mountain design embraces an eased modern style with elements of stone, wood and iron inspired by its 2.06- acre natural setting, and affords incredible mountain views from multiple decks and terraces. Sumptuous interiors in concert with nature are the essence of this true Colorado retreat. Led by Steve Miller, a former United States Army Officer and West Point graduate, Galiant Homes offers a collective 60 years of luxury home building expertise. The company has achieved dozens of industry awards, including the distinguished Housing & Building Association People’s Choice Award for Best Custom Home two years in a row. They bring fresh ideas and craftsmanship to every detail of the home building experience. Stop by the new Colorado Golf Club sales center and model home located at 8776 Eagle Moon Way this Sunday, June 24th from 11:00 a.m. to 5:00 p.m.